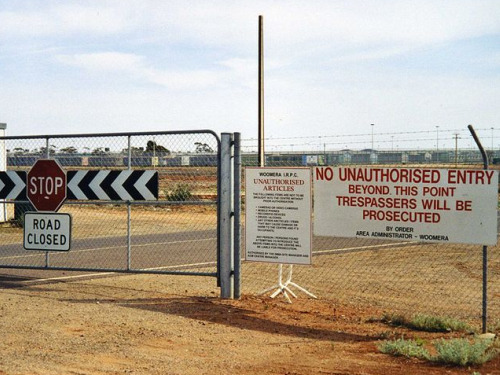 The Greens have described the Federal Government's decision to reopen the Howard-era Curtin detention center as a backward step in asylum seeker policy, saying the disused WA Air Force base had been described as a "living hell hole," during its use under a previous Government. Immigration Minister Senator Chris Evans' announcement that his Government would reopen the controversial center located on the desolate north coast of Western Australia, has alarmed refugee advocates who claim the base is the "worst of the worst" of detention centers. "Given the history of Curtin and the length of time that detainees will be condemned to he held in Curtin, the Minister's decision amounts to criminal human rights abuse," said Ian Rintoul, spokesperson for the Refugee Action Coalition, in an April 18 statement. He claimed the Government's policy was a return to Howard era refugee policies and accused the Government of exposing asylum refugees to mental health problems. "Australian of the Year, Professor Patrick McGorry warned that detention centers were factories for mental illness, yet the Minister is about to open the worst of the worst," Mr Rintoul said. "It is calculated decision to isolate a particularly vulnerable group of people and keep them away from public scrutiny. We also remind Chris Evans that Sri Lankan and Afghan asylum seekers are people, not a 'case load'." "Two weeks ago, Chris Evans said the Rudd government would not go down the Howard road to abuse of refugees. Now even his language is becoming 'Ruddockesque' in the attempt to hide the reality that Labor is mimicking Howard's treatment of refugees." Senator Evans announced on Sunday that the center will be operational after an upgrade of the facilities was completed and said the decision had been made following the previous week's contentious decision to suspend applications from asylum seekers from two countries where the Government claimed conditions had improved. "As a result of (last week's decision to suspend) applications for asylum seekers from Sri Lanka and Afghanistan, we'll be opening a new immigration facility at the Curtin Air Base," Senator Evans told reporters in Perth. "Previously, it's been used for this purpose and initially we'll be upgrading the facility to accommodate that cohort of persons who have had their asylum claims suspended." "We need to find an appropriate secure facility to deal with these asylum seekers. I expect the center to be operational following completion of the initial upgrade," he said. However Greens spokesperson Senator Sarah Hanson-Young told reporters on Sunday the Government's recent policy backflips on refugees resembled a "dog's breakfast" and she was "very concerned" at the Government's new policy decisions which she claimed lacked a humane approach. "I'm very concerned that this is just another part of policy-on-the-run from the Australian government," she said. "The immigration policy, the refugee response from the government, is a dog's breakfast -- it's one announcement after another without the real follow-through of any type of practical long-term or humane approach." The Greens refugee spokesperson said the Curtin detention center under the Howard Government had been described as a "a living hell hole," and questioned whether or not this was a permanent change in policy for the Government. "I understand the minister is saying they'll need to spend considerable amounts of money to upgrade the facility and I guess that brings the question as to whether this is really a temporary response from the government," Senator Hanson-Young said. "It seems fairly clear that the government is now putting in place the infrastructure to support their new indefinite detention policy." "This is not a short-term fix for the government ? this is a change of policy," she added. Senator Hanson-Young said the Government was obviously attempting to neutralise the issue in the lead up to the federal election however said it had broken a promise to move away from hardline policies towards refugees. "Everything he's announced over the last couple of weeks harks straight back to the days which were discredited under the Howard government, where we detained vulnerable people in the middle of the desert, where we detained children behind barbed wire." "This is a government who said they would work to dismantle that regime and now we see them implementing it themselves." Senator Evans said the Curtin center would be expected to house 200-300 single males, in order to assist overcrowding on Christmas Island.